The Champions League has been as fantastic as ever so far this season with an incredible Last 16 stage full of upsets and turnarounds. 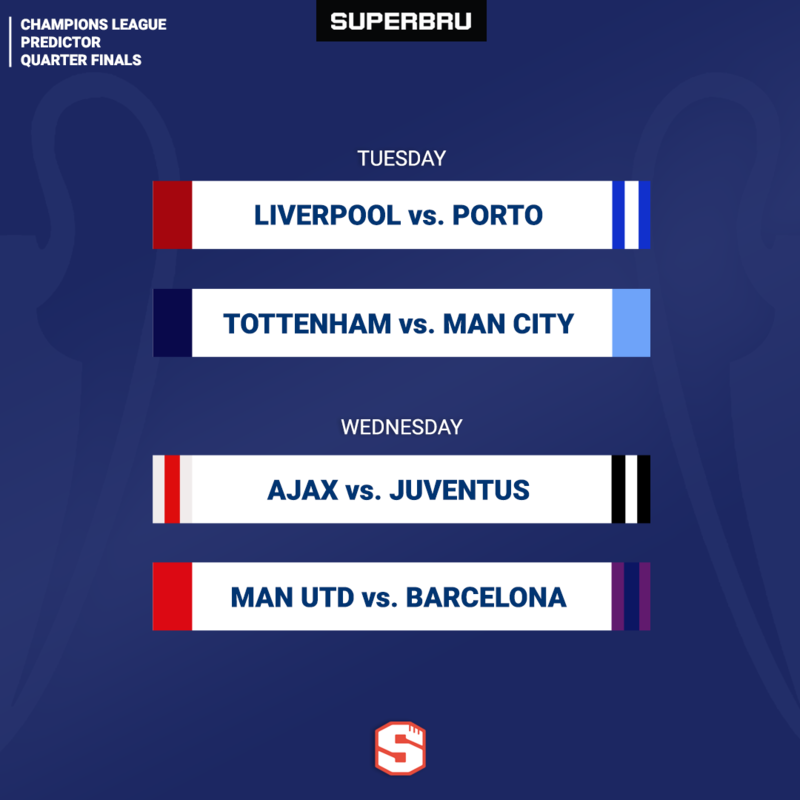 We now have eight teams remaining in the competition, four of them from England, as Ajax, Juventus, Barcelona and Porto all look to ensure they lift this year's title rather than a Premier League side. Though both Madrid teams fell in the Last 16, three of the sides that have been touted as big contenders for this tournament since the beginning remain - Manchester City, Juventus and Barcelona. All three have avoided one another in this quarter-final draw. Here, I'll be running you through how each team is looking ahead of their games this week as well as providing an update on team news to help with your Champions League 5-a-side fantasy selections. First up, the most one-sided looking tie of the round. After progressing through the weakest of this year's Champions League groups, Porto defeated Roma in extra-time to reach this stage and now face the side that they were eliminated by in last year's competition. Domestically, Porto sit joint top of the Primeira Liga table with Benfica and have been solid defensively but they've kept just one clean sheet in the Champions League this season (vs. Galatasaray at home). That may not be their biggest concern heading to Anfield though, as an away goal is an absolute must if they're to stand a chance of progressing. As you're more likely to know, Liverpool currently sit top of the Premier League and it's no secret that a domestic title is more of a target for Klopp and his men than this competition. That said, Liverpool are notoriously good in Europe and should defeat Porto even if they aren't at their best. The Reds scraped through the group stage but performed very well against Bayern Munich in the last 16. They can also take real confidence from the fact they battered Porto 5-0 in Portugal when they met last season. Liverpool team news: The big news is that left-back Andrew Robertson is suspended for this match - reports suggest James Milner may be preferred to fill in out of position ahead of Alberto Moreno. Joe Gomez is back in full training and could well make a match squad soon. Porto team news: Porto have a significant defensive absentee of their own due to suspension as Pepe will sit this one out. Vincent Aboubakar is still recovering from a lengthy cruciate ligament injury. Prediction: Liverpool will be focused on not conceding an away goal so you'd expect them to do so. Their front three are always a threat and Klopp is likely to want this tie over before they head to Portugal. 2-0. The venue of this game is arguably the most significant factor. Tottenham's dismal run of form came to an end last week as they defeated Crystal Palace in the opening competitive game at their new stadium and you can expect a very excitable atmosphere with this being the first ever European clash at the club's new ground. Spurs have been going OK in Europe since their opening two games and looked strong against Borussia Dortmund in the Last 16. However, they haven't beaten Manchester City since 2016. City are still on for a very unlikely quadruple this season; such has been their level of quality for the majority of this campaign. It's been a while since Pep Guardiola's side put a foot wrong, which leads to questions of when an inevitable slip will come, and this will be a very tough opening leg for City. Again, the focus will be on grabbing an away goal, which they'll feel should be enough to progress to the semi-finals provided they don't lose by more than a goal. Tottenham team news: Serge Aurier, Eric Dier and Erik Lamela are unavailable. Manchester City team news: Zinchenko is expected to miss out though Mendy returned for City's FA Cup semi-final and is in contention for this match. Delph is also back training. Sergio Aguero is fit to play. Prediction: Manchester City will always aim to dominate a game they are involved in though we can perhaps expect some caution here. The stadium should be rocking and Tottenham will know this is a game they need to win. I'm not sure they can quite manage that, but I also think City will struggle to win having played far more recently. 1-1. After stunning Real Madrid who have dominated this competition for the last three years, a young and exciting Ajax team now face Juventus who are powered by the man who led that Real dominance, Cristiano Ronaldo. The famous Dutch club are currently joint top of the Eredivisie with PSV, but make no mistake, all attention will be on whether or not this team can again punch above their weight and take down another European giant. Juventus arrive having already won Serie A (essentially) meaning their entire focus is on this competition. Cristiano Ronaldo, who was bought with the specific aim of helping Juve win the Champions League, has been rested for the last few weeks to ensure he is over a minor injury in time for this clash. Though Juventus have lost their last two away Champions League games, Ronaldo's hat-trick that turned things around against Atletico in the Last 16 will provide huge confidence ahead of this tie. Ajax team news: Right-back Noussair Mazraoui is suspended. Juventus team news: With Ronaldo fit, there are no major injury concerns. Prediction: This will be a very tough game for Juventus against an impressive Ajax side. Like Real Madrid in the L16, I expect the Italians to manage a narrow victory in Amsterdam. They should then go on to progress unlike Real though! 1-2. The tie of the round. Yes, there's a considerable gulf in quality between these two clubs, but the size of each of them makes this box office. A miraculous performance from United in Paris saw them eliminate PSG and reach this stage, but recent Premier League performances suggest they'll need even more of a miracle to get past the team that all but sealed another La Liga title at the weekend. One thing that is in United's favour is Barcelona's questionable away form in Europe. Barca have drawn at Inter and at Lyon in this year's tournament and failed to win a knockout away game in last year's tournament - drawing 1-1 at Chelsea and losing 3-0 at Roma. Of course, the Catalan giants have been incredible at home meaning United would still need to win comfortably at Old Trafford to feel as though they have a strong chance of making the semi-finals. The fantastic form of Lionel Messi this season means Barca remain strong favourites for this game and the tie. Man Utd team news: Alexis Sanchez remains sidelined with injury. Juventus team news: Besides Rafinha being out for the season, Barca have no notable absentees. Prediction: Barcelona should certainly be the team to make the semi-finals, but I feel their pattern of underperforming away from home before demolishing sides at the Nou Camp may continue. 1-1. Barca united draw? Jack, predictions should be made with head.